Walleyes are known to exhibit finicky feeding habits, but there are times when they hit artificial lures with reckless abandon, even Musky sized lures. Most often they have to be tempted and teased using live bait presentations which account for the majority of walleyes caught. Walleyes are a schooling fish, find one you usually find others. Most often they relate to structural elements like rock humps, inside turns, breakline transitions, and man made cribs. This is why the presentations must be precise, to offer your bait in the strike zone. Other times on large bodies of water (Great Lakes) they scatter or suspend over a feature less bottom following schools of baitfish. This explains why boat control in both applications is such an important part of walleye fishing, whether it be while working a jig and minnow at a consistent depth or trolling with crank baits/spinner rigs. 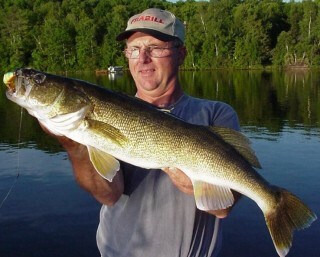 Fishing with live bait for walleye offers the angler versatility of presentations and can be fished on a slip sinker or a slip bobber rig, pulled behind a spinner, tipped on a jig, or simply fished with a plain hook and split shot. There are three types of live bait used for walleye: Minnows-Leeches and Night Crawlers. Jigs are the most common lure used for walleye. It allows the angler to reach the depths where walleyes inhabit. Most walleye anglers tip their jigs with live bait for added attraction and scent. How to work a jig depends on the time of year. When the water is cold and the walleyes are sluggish, use a very slow presentation, short gentle taps on the retrieve works the best. For warmer water walleyes, they become more aggressive, try an intense jigging retrieve. In both cases to work the jig properly, cast it out, let it sink to the bottom, then retrieve with a series of twitches and pauses based on the time of year. After each twitch maintain a taut line while the jig sinks back to the bottom. Walleyes usually hit while the jig is sinking. If your line is not taut you won’t feel a strike, sometimes you will feel a distinctive tap, other times you will feel light pressure as if the jig is hung up. Whenever you feel anything different set the hook. When fishing with jigs a must have is a fast action sensitive rod so you can feel even the lightest taps, the fast action gives the power for an immediate hookset. Walleye are known for picking up live bait and dropping it as soon as they feel any type of resistance. The slip-sinker rig eliminates the resistance, as a walleye strikes the bait the angler free spools the line allowing the walleye to swim away to eat the bait for a hookset. The slip sinker rig is made up of three components, a hook, sliding weight and a stop. They can be purchased pre-tied at most sport shops or you can make your own. Fishing the slip sinker rig is quite easy, after a cast allow the rig to sink. When you pull the rig the stop catches the sinker as it moves along the bottom allowing the bait to look natural for an easy meal. The sinker is the most important component, it must be heavy enough to get the rig to the bottom. A rule of thumb is 1/8 oz for every 10 feet of depth. Most anglers use an egg or walking type of sinker, but in vegetation a bullet type sinker works best allowing the rig to slide through the weeds. For hooks the smaller the better, size 6-8 octopus to maintain a natural look. The stops can be a barrel swivel, to make it adjustable a bobber stop or a very small split shot can be used. Most often walleyes relate to bottom structure, leader lengths of 18 to 36 inches works the best. When walleyes suspend at a certain depth on a piece of structure (rock pile, crib, or submerged hump) the slip bobber rig is highly effective by presenting the live bait at a pre set depth, putting the bait right in their face. You can make slip bobber rigs rather easy or buy them at sport shops. To make a slip bobber rig simply start with your stop attached to the fishing line, you can use a piece of string or a rubber band knotted on the line thread on a small bead then the bobber. Add a small spilt shot below the bobber for balance then tie on a hook size 4-6-8 and bait with a minnow leech or night crawler. Fishing with spinner rigs for walleyes is one of the oldest techniques dating back to the strip on days (Prescott Spinner slide thru a minnow rig) to the newest minnow and crawler harness made today. Spinner rigs must be weighted to get to the bottom. You can add a rubber core or split shot a few feet ahead of the spinner rig for drifting but most anglers prefer using a bottom bouncer or a three way rig to keep the spinner in contact with the bottom. For sinker weights a ½ oz will get you down to about 10 feet add another ½ oz for each additional 5 feet. Another very popular spinner for walleye is the weight forward spinner primarily used on Lake Erie. Walleye anglers tip the spinner with a piece of night crawler leaving an inch or so trailing behind the single hook. Fishing with weight forward spinners, you simply cast it out and count down to different depths to locate walleyes, then maintain the retrieve fast enough to keep the forward blade rotating. Attached to the line that spreads fishing lines horizontally. A diving device attached to the line that planes down and to the side. A weighted fishing line that allows walleye anglers to use shallow running lures (spoons & crank baits) to reach desired depths.